Made by the North American Aviation, the B-25 Mitchell was a dual-engine aircraft used by several allied forces during the Second World War. Almost 10,000 B-25 bombers in various types were made since its production started. The aircraft was manufactured as a way to honor General Billy Mitchell, a pioneer in US military aviation. Its design was inspired by the blueprint of another model of Mitchell B-25, which is the NA-40. The aircraft became popular when it was used as a bomber plane in the Doolittle Raid that occurred in 18 April 1942. During this time, Lieutenant Colonel Jimmy Doolittle led 16 B-25Bs, which attacked mainland Japan. The attack was done four months after the Pearl Harbor bombing. 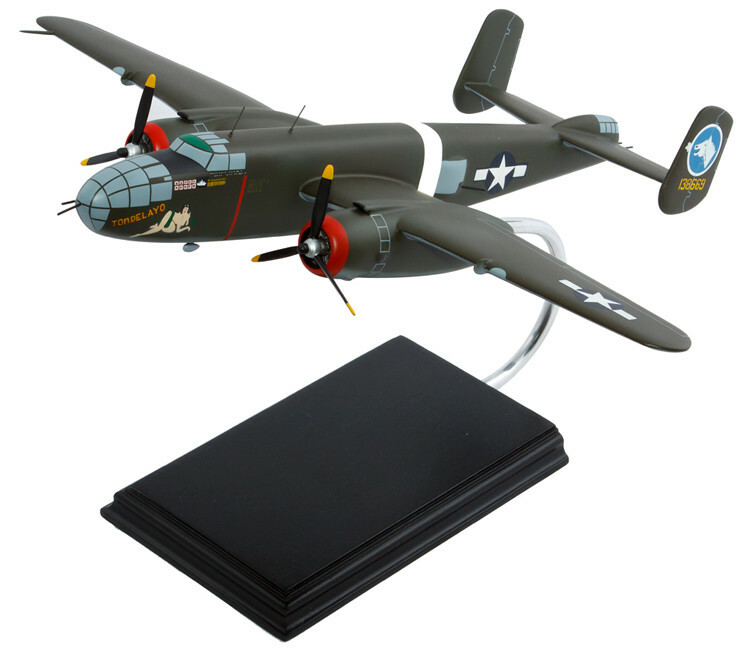 This airplane model is painted as B-25 Mitchell “Tondelayo” which is inspired by the character played by Hedy Lamarr in the 1942 movie ‘White Cargo.’ Unleash your childish side by adding this handsome piece of art to your collection. With its elegant design features, you are sure to be a proud owner and a certified aviation buff.